The SA-PCC OC‘s South Australian Prostate Cancer Symposium is pleased to announce this years guest speaker will be Associate Professor Anthony Lowe, CEO of the Prostate Cancer Foundation of Australia. The Symposium, now in it’s fourth year, brings together prostate cancer researchers, clinicians, educators and advocates from around the state to hear about research and initiatives aimed at advancing the treatment and outcomes of prostate cancer. The forum provides an important opportunity for networking which has proved to be valuable in the past. The symposium will be held at the Stamford Plaza, North Terrace and is generously sponsored by Ferring Pharmaceuticals, IPSEN, AstraZeneca, Tolmar Australia, Abbvie and the SA-PCCOC. 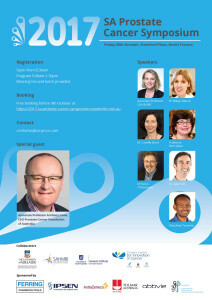 This year Centre speakers include Associate Professor Lisa Butler, Dr Camille Short and Dr Luke Selth. This entry was posted in Events, News, Research and tagged clinical, collaboration, PCFA, prostate cancer, research. Bookmark the permalink.